Brush Layers , also known as "brush matting," is used to protect river banks and hillsides that are vulnerable to erosion and ground scrubbing when a river is swelled or flooded. Live branch sections - also called "live stakes," "live planting" and "pole planting" - are laid sideways into the bank and partially buried into a trench of wet soil. The branching roughens the ground surface, thereby slowing the flow of water run-off. Protection of the land slope is further stabilized when the live branches take root and become bushes, thus also binding the soil with their root system and blocking the water flow with its foliage. The benefits of natural fascine and Brush Layers administration are without a negative consequence. Their usage provides an environmentally-friendly option that is easy to implement, low-cost, and versatile to many land applications. Willow, red osier dogwood and black cottonwood are commonly used in brush layering because they are hardy, durable, and adaptable plants that are easy to grow with excellent root strength. Bio-engineering with such provides a bio-sustainable solution for flood control, erosion control, drainage speed, and soil filtration, thereby benefiting the land. The systems trap soil and debris being carried via run-off, thus protecting tributaries and communities downstream. 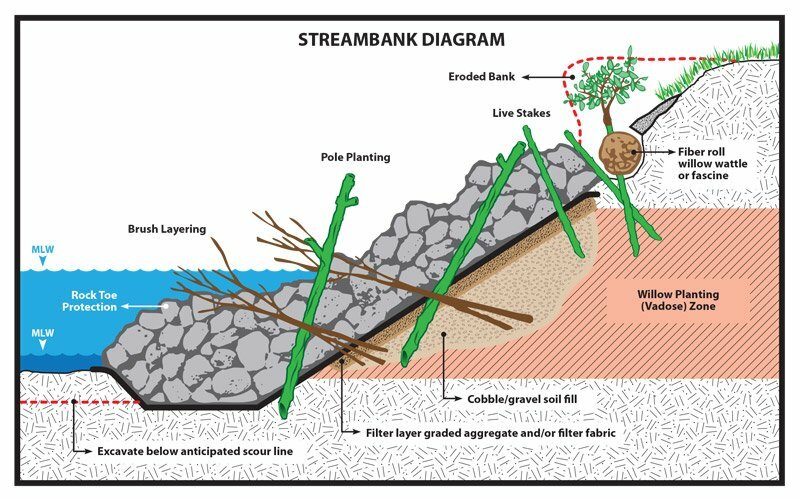 Brush layering, via live stakes, slows water flow over the land surface and, together with the renewed root system, provides effective water penetration into the soil. The shrub growth also provides a windbreak for people, animals, and crops. Best of all benefits, you realize a highly effective system at a meager cost.